Summer in Berlin — freer. It's raining, I've got my eyes closed and one hand on the shoulder of a Scottish CEO in front of me as we shuffle down a gravelly path to the sound of the rain, chattering German schoolchildren and lunchtime traffic. 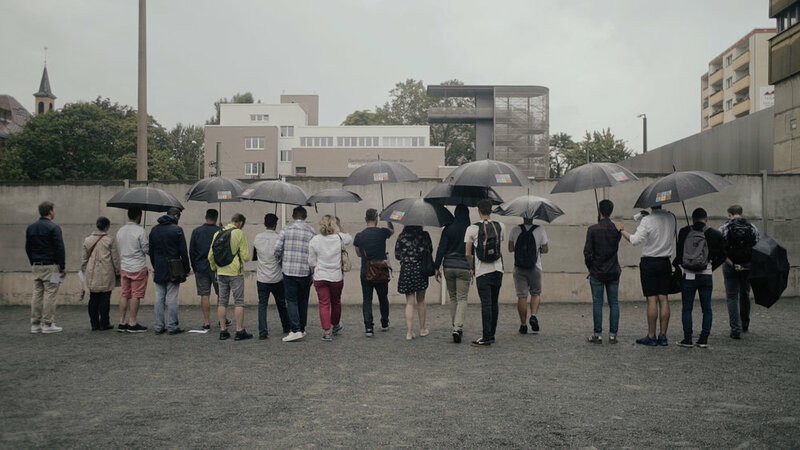 FutureX's Laura Westring asks us to open our eyes and we find ourselves standing in front of the Berlin Wall in what was "No Man's Land", the 27-mile strip of land between the inner and main walls that divided East and West Berlin for almost thirty years before reunification. Later, we hop back on the U-Bahn for an evening of pitches by startup founders at Factory, an uber cool tech campus that straddles the line that divided a nation until 1989. Factory is home to US tech giants Google and Uber, large German corporates like Deutsche Bank and Volkswagen and scores of startups. Some of the Scottish contingent get up on stage to pitch and when the formalities of the evening wind down, we get stuck into local craft beer and chilli hotdogs as a DJ starts his set. I introduce myself to a Somalian herdsman who has developed a technology platform for trading goats that aims to remove many of his countrymen from seasonal poverty. Before I know it, we've done a selfie and it's up on Twitter. We're in the heart of Berlin's tech scene and an event running next door is part of the Tech Open Air festival which draws around twenty thousand attendees to the city every July. The windows are wide open, warm summer air breezes in and the rain is still falling on the memorial park in the fading light. I catch a last sight of the wall and get a realisation that what I've seen and heard about it today has had more of an impact on me than I first thought. Coming out ofreverie, I notice the local founder who pitched about his plan to launch a bank for refugees is being crowded by a techie fan club. We meet a Kiev-based founder and are soon planning a possible trip out to Ukraine later in the year - we even check flights on Skyscanner as we talk. "Hey, I didn't know those guys were Scottish", says Sergey. Berlin is a remarkable place and there's a special feeling in the air, in large part due to the equally remarkable people at FutureX who are running the Berlin Summit in partnership with Entrepreneurial Scotland. Partnering with FutureX on international events is a deft move from Entrepreneurial Scotland, as the team are high quality with strong global networks particularly in all things digital. They are young, thoughtful and meticulous in their planning. Using a tech speak analogy, you could describe FutureX as disruptors in entrepreneurial leadership. They also happen to be damn nice folks and, unsurprisingly, have attracted a like-minded collective of not only some of Scotland's most promising young entrepreneurs and business leaders but CEOs from as far away as Australia. The fact we're in Berlin is no accident. Industry commentators view the city as the rightful pretender to London's tech throne and Europe's Silicon Valley and see its technology startup cluster moving ahead of the UK's capital over the next decade. The trends that support this prediction include the number of international venture capitalists setting up shop in Berlin - growing at a faster rate than anywhere else in Europe - and stats indicating that German VC exits are set to exceed UK deals for the first time this year. So what else stacks up in Berlin's favour? In a beer hall the previous evening, a Glaswegian barman says you can work and live in the city without having to speak German. And, of course, Germany, unlike the UK, has a well documented open attitude to immigration. Berlin's tech scene does not have to compete for talent against a "gorilla industry" like the City in London, the cost of living is much cheaper and it's got a domestic market that is performing strongly with easy access to other European economies. On the plane home, I consider that if we ever open an international office I'm pretty sure I know where I want it to be.